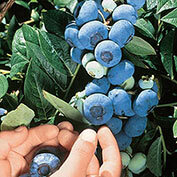 Chandler Blueberry | Gurney's Seed & Nursery Co. 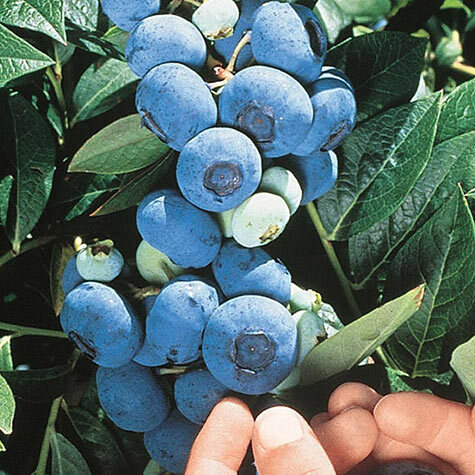 Huge, deep sky blue berries cover this 5 to 7 ft. shrub in July. Self-pollinating, Chandler has one of the longest ripening seasons ever. 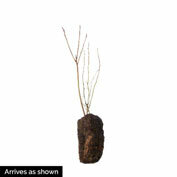 You'll enjoy these big (the size of a quarter), delicious berries for more than six weeks during the summer. Pest- and disease-resistant. Foliage puts on a show in shades of wine and orange in the fall. Zones 4-7. Comments: World's largest blueberry. Produces berries the size of a quarter. Long ripening season ensures that you are able to enjoy these big delicious berries for an even longer time period - over 6 weeks in the Summer!